White Elephant Safari Lodge stands beside glistening Lake Jozini at the foot of the ancient Lebombo Mountains in Pongola Game Reserve, KwaZulu-Natal. A wrap-around veranda, indoor and outdoor dining areas, a swimming pool and sundowner deck offer fine living in a special corner of Africa. Eight luxurious safari tents are set in a wilderness brimming with wildlife and birds. 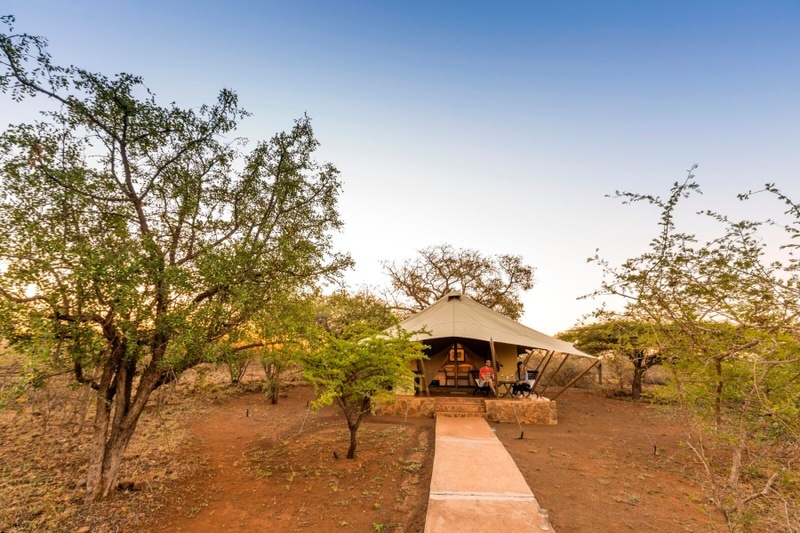 Each tent has its own bathroom, outdoor shower, bush-view verandah and personal bar. Enjoy a gentle boat cruise, try your hand at tiger fishing, and explore the wilderness on guided walks, game drives and eco-conscious ‘elephanting’ and rhino tracking excursions. White Elephant’s offerings constitute an excellent combination of water- and land-based safari activities in a malaria-free wilderness that supports 4 of the renowned ‘Big 5’ of South Africa’s wildlife. Children: 12+ at Safari Lodge, all ages at sole-use accommodation. HONEYMOON OFFER 2019: The bride receives a 50% discount on her accommodation, subject to a minimum 3-night stay and availability at the lodge, and subject to the stay being within 6 months of the wedding date. Valid for travel throughout 2019. LAST MINUTE SPECIAL OFFER 2019: 40% Discount when booking within 7 days of travel, subject to availability and valid throughout 2019. Please ask us for advice and suggestions about conference facilities in the area.